CLICK HERE TO PURCHASE A SIGNED / INSCRIBED HARDCOVER EDITION FROM THE AUTHOR. 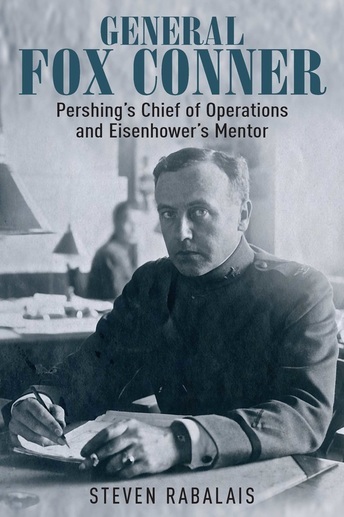 John J. Pershing considered Fox Conner to have been "a brilliant soldier" and "one of the finest characters our Army has ever produced." During World War I, General Conner served as chief of operations for the American Expeditionary Force in Europe. Pershing told Conner, "I could have spared any other man in the A.E.F. better than you." Dwight D. Eisenhower viewed Fox Conner as, "the outstanding soldier of my time." In the early 1920s, Conner transformed his protege Eisenhower from a struggling young officer on the verge of a court martial into one of the American Army's rising stars. Eisenhower acknowledged Fox Conner as "the one more or less invisible figure whom I owe an incalculable debt." This book presents the first complete biography of this significant, but now forgotten, figure in American military history. "General Fox Conner is a figure from American military history that more people ought to know. I encourage anyone with an interest in well written (and thoroughly researched) works of history to read Steven Rabalais' new book on General Conner." - Winston Groom is the author of Forrest Gump and numerous works of history including The Generals: Patton, MacArthur, Marshall, and the Winning of World War II and A Storm in Flanders: The Ypres Salient, 1914-1918 Tragedy and Triumph on the Western Front. "Author and historian Steven Rabalais provides a compelling narrative account of the life of General Fox Conner, one of the most influential, but least known, figures in American military history. Conner was not only one of the leading combat planners and leaders in World War One, he insightfully identified the young talent that would lead the nation on the battlefields of Europe in World War Two. Rabalais finally gives Conner his due, in a biography that is both dramatic and compelling. This biography not only puts Conner on the map, it highlights Rabalais as one of the truly gifted historians of the American military." - Mark Perry is a journalist and author of nine books. His latest work is The Most Dangerous Man In America, a biography of General Douglas MacArthur. Click here to see additional reviews.